Yes, you can and we’re going to let you into a little secret: there are no fattening foods. Yes, you read that right: fattening foods do not exist. Sorry, but what form of madness are Paul and Ann talking about, you may ask? Surely, there are hundreds, if not thousands of fattening foods. Otherwise why are there over two billion overweight or obese  people walking the Earth today? Well, take your hand out of the biscuit tin and we’ll explain. It’s important to understand that any form of weight management is relative to your lifestyle. Food may be high calorie or low calorie, but your lifestyle will dictate whether it’s fattening or not. For example, a cheeseburger is not ‘fattening’ to ultra-marathon runners. Yet, if you have the activity levels of a two-toed sloth having an afternoon nap, you could probably gain weight eating broccoli. 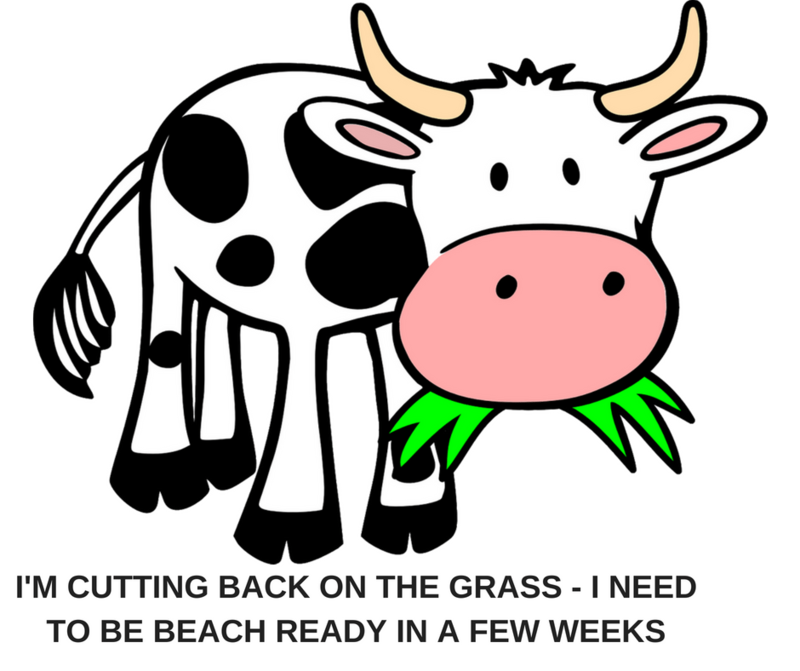 Our favourite comeback to the fattening food question is: look how fat cows are, and they only eat grass! For any weight-loss plan to work it must follow a basic, unarguable rule by creating a calorie deficit. It doesn’t matter what diet you show us, we’ll tell you how it manages to reduce your calorie intake to less than your expenditure. (We go into this in more detail in our books and other articles. See related reading at the end for more information). So, there isn’t anything that you can eat or drink that automatically creates weight gain or weight loss. Therefore, there are no fattening foods. Likewise, the reverse is also true: diet foods don’t exist either. But don’t rush down to McDonald’s just yet. Okay, so is there a point to this article or are we just bandying semantics? Well, yes, we being a little obtuse, but there are some very important points to consider. First, simply dividing your foods by‘fattening’ or ‘diet’ tags may not solve your weight problems. In fact, it may make them worse. Why? Because some ‘fattening foods aren’t necessarily fattening and some ‘diet’ foods can pile on the pounds as well. Try to realise that it’s often not just what you eat, but how much of it as well. Portion size is a major consideration when trying to lose weight. So, maybe the terms: fattening, diet, healthy, good, bad, etc., are no longer looking so clear cut after all? Another issue is that these terms are too black and white; they are an either/or category. When in truth, the solution to most people’s weight problem is usually varying shades of grey. When we work on a client’s diet – or training plan- we use two other, less polarising terms: help or hinder. We find this allows them more flexibility when making food choices. But it’s probably not just you that gets this wrong, other professional organisations do it as well. And their mistakes can be life-changing. My health insurance company recently asked me to complete an online health questionnaire. Upon completion I would be awarded a score and offered discounts if my totals achieved a minimum level. One of the first questions was: do you eat full-fat dairy products? I ticked the ‘yes’ box and was immediately shown an emoji of a frowning face. I was then informed that because I was eating a ‘fattening food’, my score would be reduced. This is a prime example of mislabelling because dairy produce is packed with protein, healthy fats and essential nutrients. But the important question is: how did they know it was fattening? They don’t know how often or how hard I train. They don’t know that I’m on my feet all day and they don’t know what else I eat. So how did they know it was fattening? The answer is, they don’t. They are just making the same automatic, unsubstantiated assumption that high-fat foods are fattening. In my case, I didn’t bother filling in the form and didn’t apply for the discounted rates. But to someone who didn’t know better, full fat dairy would forever be a ‘fattening’ food. And as such, could now be missing out on an excellent source of nutrition. Understanding the implications of using inaccurate terminology is one the fundamental principles that we try and teach our clients. We explain about putting things in their proper context. That all foods have pros and cons but that they are totally subjective to the individual’s goals and lifestyle. And above all, we apply a much unused, yet vital principle: common sense. We tell them that it’s not the small piece of cake they’ve just eaten that will make the difference. Nor will it be the once-a-week jog around the park. But that it’s the rest of the stuff in between that also counts. It’s about lifestyle change and most of all, it’s about consistency. We try to instil the idea of not trying to be perfect and get everything right. But to start getting it right more often than getting it wrong. In the long run, consistency will beat perfection hands down every time. Simply because life is never straight forward, and it rarely, if ever, goes to plan. There will be times when you can stick to a great eating plan and times when you can’t. Small weight fluctuations are both inevitable and natural, so accept it – just don’t let it get out of hand. Our advice is to live by the 80/20 principle. This means that 80% of the foods you eat and the life you lead will take you a step forward on the road to success. But you’re allowed a 20% detour down the naughty path to keep you sane. Our methods don’t promise that you can have your cake and eat it. But that doesn’t mean you can’t have the occasional slice! So, stop thinking of ‘fattening’ and ‘diet’ foods and start thinking of your overall lifestyle, not just what you put in your mouth.